Did you know the lucky country is sinking? This young scientist is investigating why. Are you living in Australia? Do you ever get a sinking feeling? It could be because our continent is sinking. But don’t be alarmed just yet. Surveyor and University of Tasmania PhD candidate Anna Riddell is investigating. 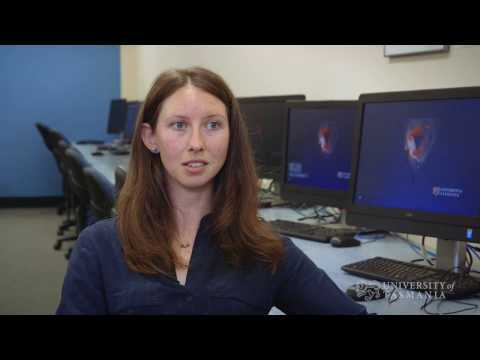 After an exciting career in industry, Anna has returned to the University to research vertical land motion, and how the Australian tectonic crust is moving in space. "It's one of the fastest moving plates, if you look at it horizontally. It moves at around seven centimetres per year,” she said. Anna's research is trying to solve that conflict, which is vital for future sea level estimates. We can measure things that change at a millimetre per year, so we’ve got some pretty good gear here at the University of Tasmania. Anna studied a Bachelor of Surveying and Spatial Sciences at the University of Tasmania, and in her Honours year, she researched sea level extreme events at Macquarie Island, which included a 10-day expedition on the Aurora Australis. Post-Honours, Anna took up a position at Geoscience Australia, the national mapping agency, on the strength of her degree. Being a surveyor from UTAS holds quite a lot of weight. Her career has taken her all over the world – to China, Los Angeles, Germany, and Vienna. And just five years out of University she has already helped to draft a United Nations resolution. “The degree at UTAS gives you the ability to walk straight into a surveying firm. There is a lot of practical training. Hit the ground running. Study a Bachelor of Surveying and Spatial Sciences at the University of Tasmania. Want to travel the world and work with animals? This uni degree will give you amazing opportunities. The Australian continent is sinking…but why? And what does it mean for sea level rise?